The toy craze that has swept the nation — cheaply manufactured fidget spinners of dubious metallic constitution — is probably on the way out, with the high-water mark of fidget obsession appearing to be about a month behind us and the interest in the glorified ball bearings plateauing or declining. 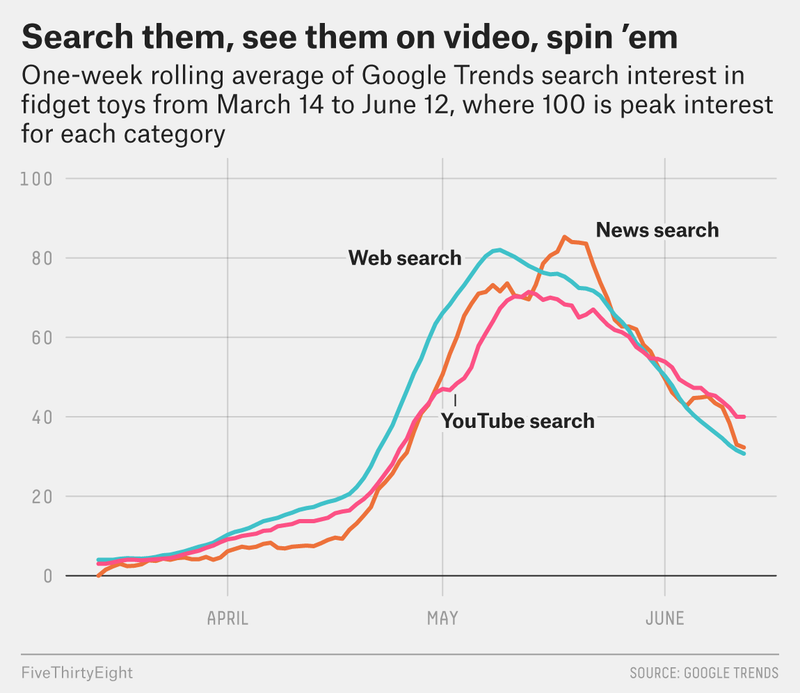 Trend-spotting is an imprecise science, but to approximate the spinners’ popularity, I relied on Google Trends reports in three categories: Google News searches, web searches and YouTube searches. Given the ridiculous popularity of fidget-spinner content on YouTube, I also pulled all the videos that made the top daily trending list — YouTube’s own tally of the most viral videos, determined by algorithm — going back to the beginning of the year, with a focus on when fidget spinners exploded stateside in March. Google web search interest peaked in early May — presumably with the first batch of people wondering why on earth their child had come home from school with a PVC throwing star — with maximum interest in the U.S. on May 6, according to Google Trends. 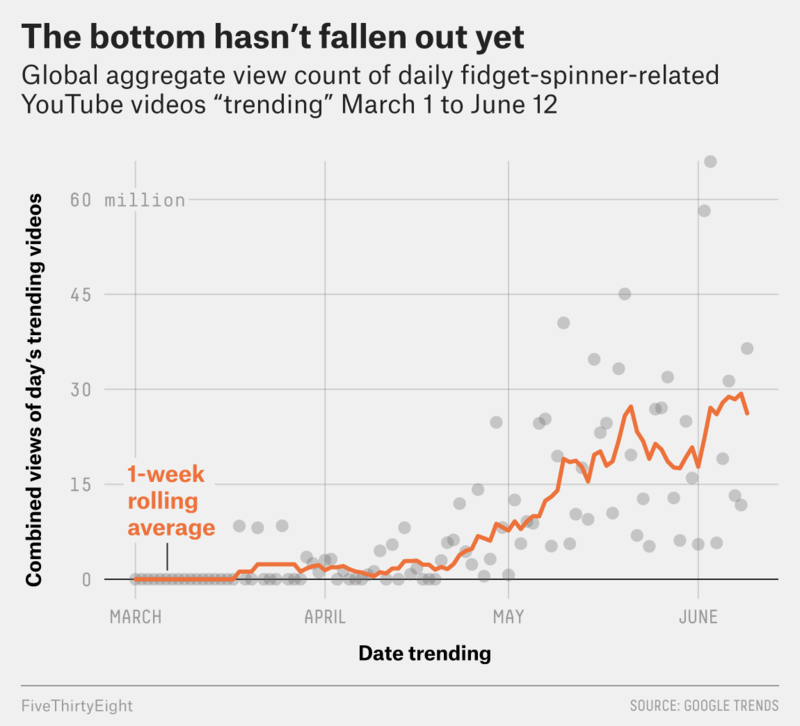 Then the fad made its way to internet news consumers over the next week; May 18 was the high-water mark for fidget spinner news searches. Then, of course, came capitalization from brands trying to cash in on the trend. If you want to make money off the attention cycle of the youth, the second-best way (after selling them a fidget spinner, duh) is probably through YouTube ads. The platform’s daily trending video section — a selection of up to 200 daily videos that have performed the best on the platform on a given day — is ground zero for monitoring this trend, given its primacy as the metric of success on the platform. YouTube creators are in the business of racking up views, and the glut of fidget-spinner content cashing in on the trend (as seen through this selection of all trending videos that mentioned “fidget” in the title) appears to have maxed out. The earliest 2017 mention of fidget technology in the trending videos section was “What’s Inside a Fidget Cube?” from the What’s Inside? channel, way back on Feb. 12. It’s a literal dissection of one of the more complicated fidget-adjacent products. It’s not until a month later that we get our first spinner offering trending on YouTube, with the exhortative “CRAZY FIDGET TOYS YOU MUST TRY!” video from Guava Juice 2 on March 18. After this, it all accelerates quickly: “Are Fidget Toys Bad For You?” and “Playing With Top Fidget Toys” from Good Mythical Morning bust into the trending section a few days later, and since then, fidget-related content has risen steadily. 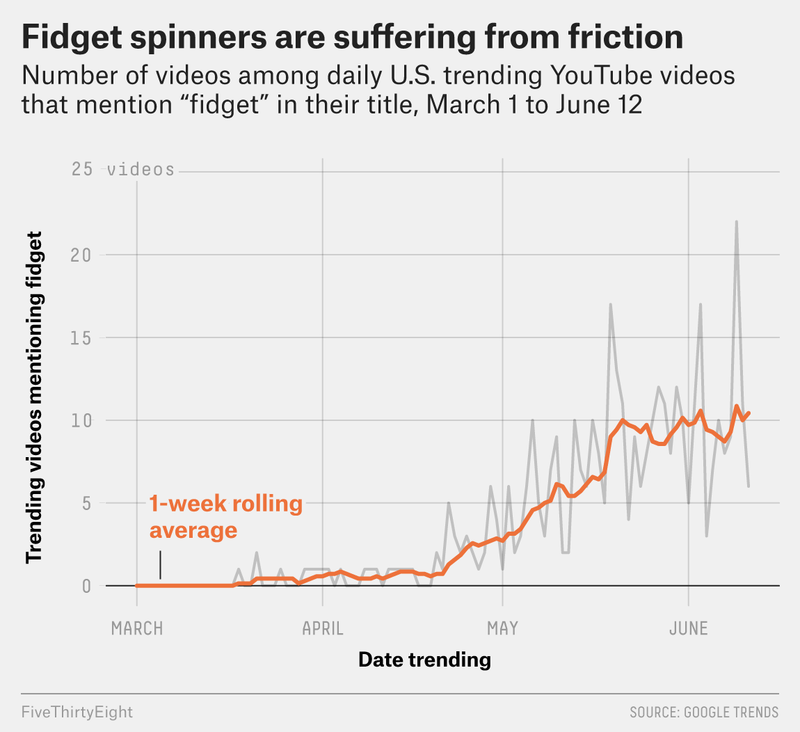 In the first 12 days of June, there were 9.9 fidget spinner videos in the top trending list on average, up from 7.5 videos on an average day in May and 1.4 videos on an average day in April. But that growth appears to be leveling off. Given that YouTube search interest seems to trail typical search interest by about a week, as seen in the first chart, the plateau could be a sign that the trend is waning a bit. This could be complicated by the school year ending as well. Although the number of trending videos related to fidget toys has begun to level off, the two best days for fidget spinner content in terms of views were in June. Even if there’s a long tail on this trend, it’s very likely that peak fidget spinner is behind us. The kind of content now doing well on YouTube is either fidget-adjacent stunt videos or videos that have taken a particularly weird turn. This doesn’t mean the ball-bearing business is doomed, just maybe don’t go long on the spinner industrial complex or quit your job to live off a fidget-related Kickstarter idea at this point.